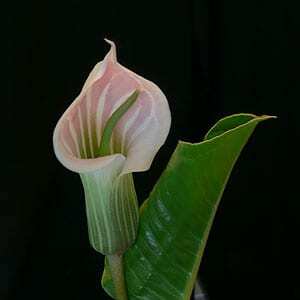 Easy to grow, Arisaema candidissimum is also blessed with attractive flowers and foliage. This is a tuberous perennial that prefers a part shaded position and is a little later flowering than some other species. Usually appearing from dormancy in december, the attractive pink striped flower appears first with a single leaf. The foliage takes over as the flower begins to fade and lasts well through summer, large glossy and leathery, making an attractive addition to the garden. You may see advice that Arisaema candidissimum will grow in full sun, however they are best grown in part shade in Australia as our climate is a little warmer than its native habitat. A humus rich, moist but well drained soil is best. 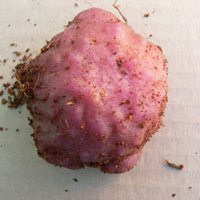 Bulbs (tubers) can be left undisturbed for 3 – 4 years before requiring lifting and dividing. Arisaema candidissimum grow well in containers as long as they are able to maintain a cool root run. We like to repot container grown plants every 2 years as once mature the bulbs are large and will quickly deplete the potting mix. Use a liquid seaweed fertilizer in early spring and again in early summer. A little slow release fertilizer in spring does wonders. Part shade – morning sun is ideal, or bright dappled shade, deep shade may restrict flowering. Grows well in the garden and in containers or pots. Mulch lightly with well rotted compost in winter. 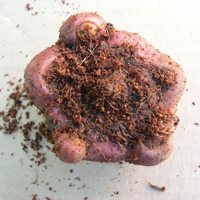 Divide in late winter, tubers will naturally seperate when ready. Top view of bulb. The roots actually develop from the top.